It was TJ's birthday this week which of course meant a party and a cake. Here he is with his mum - Sam. 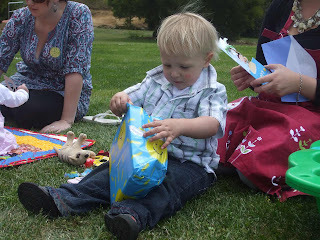 He had lots of fun opening gifts. 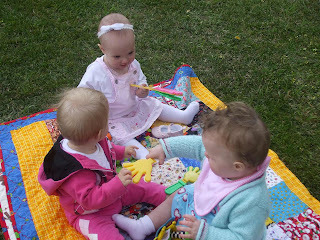 And lots of little people to help celebrate - Maddie is sitting up properly now that is her with the head band on. She had so much fun playing with her friends. There have been some fabric purchases happening including the French Hatbox range ready to make the "new" BOM to be started in the January edition of Homespin magazine. It is such a lovely range. Here are the items that I sent my partner in the Angel Swap. I hope that she liked them. The saying on the bag is one of my favourites. "A family stitched together with Love seldom unravels"
Last week I made a trip to the "Cadbury" factory. It is only around 10 minutes from my home - I am not sure if that is a good or bad thing? 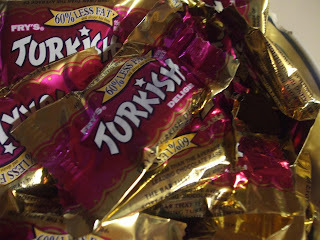 I purchased lots of Christmas Chocolates including these Turkish Delights. It says 60% less fat on the wrapper - Does that mean that I can eat 60% more? I am looking forward to the christmas fare but I can feel a new years resolution coming on. Especially after all of the lovely desserts over that period. 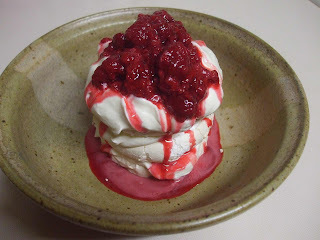 An Australian tradition at Christmas is the lovely Pavlova - This is how I will be serving ours on Christmas Day. Are you enjoying the advent swap? Are you also checking out the daily advent posts on the Among The Gum Trees Blog for lot's of festive ideas? It is so much fun. Here is a little collage of some of the gifts that Lizzie has sent me. Yum yum yum to everything - the grand babies, the fabrics, the chocolates...soooooo sweet a post!!! Glad that you're back, it's frantic at this time of the year isn't it? Love it though. Aren't you clever with the smilebox collage. I love the fabric, gorgeous colour palete. Well as a great grandmother, grin, I have to feel sorry for TJ, my goodness let loose of his hands, let him dig into that cake, take lots of photos with it all over his face, grin, blackmail him with those photos about the time he has his first girlfriend, grin. Must say though, everything else on your post today brought smiles....I love birthdays..especially for little ones...they joy in their faces is priceless!....Love turkish delights...and pavlova- mmmmmm, and love your angel swap gifts....that saying rings so true! 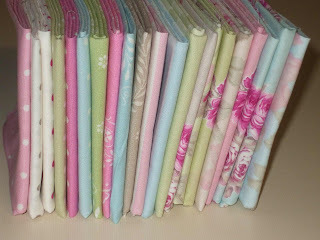 The fabrics....yummy! 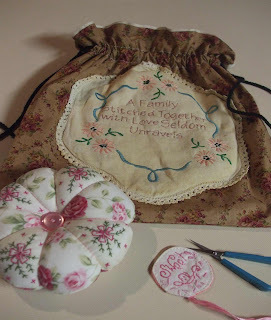 and I love how you showed off Lizzie's advent gifts....gotta learn those bloggy tricks..so effective! Hope things are brightening up your way. Did you know that if you eat 2 x turkish delights you've actually had 120% less fat for the day? Bunny Crossing looks sweet and your little people's party must have been fun, bet you were all tired that night! What are you trying to do to me ... I'm hungry now ! 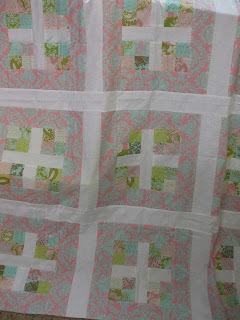 Fiona that Bunny Crossing quilt is gorgeous ! The party looked like such fun, and I can see that everyone had a blast!